Col was just over two years old when he was involved in a lawnmower accident in our backyard; resulting in Col’s foot being amputated and all of our lives being changed. Now Col is 10 and being an amputee has never stopped him from being able to do what everyone else does. Growing up with his limb amputation has opened so many more doors than we ever thought possible. Like every Grade 4 student in our town, Col plays football on Saturday mornings, playing for the Rochester Tigers Under 12’s team. He floats between full back and full forward and everywhere in between. Col doesn’t mind what position he plays, he just loves playing the game. When Col arrives home after a game he is happy to boast about his goals scored and any tackles he pulled off. Col was just starting school when our Prosthetist and Col decided it was time to have some fun with the colours of his prosthesis. Just in time for starting Prep, it was a blue prosthesis. Since then we have had red, green, camouflage fluro orange, camouflage fluro green and currently Col is sporting a prosthesis with the iconic navy and white hoops of the Geelong Cats. After meeting his beloved Geelong Cats team members in July he now even has the signatures of his favourite players on his prosthesis. It was such a surreal opportunity that so many had their doubts about it, as no one from our rural district get these types of opportunities. But Col did and lots of other things resulted out of it. 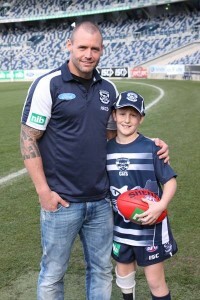 Col and our family travelled to Geelong on the Tuesday before the game for an interview with the Geelong Advertiser newspaper, to meet some of his favourite players and to go on a tour of Simonds Stadium. It was there that Col had two of his favourite players, Joel Selwood and Josh Hunt, sign his prosthesis and made his leg the envy of all his school friends. On Friday we were emailed a copy of the Geelong Advertiser article about Col, and his story and the picture of his smiling face was on the front page! We quickly arranged for a friend to buy copies and the whole family glowed with pride. It was just amazing to think that people loved our Col as much as we do and that an amputation from an accident could open such fantastic doors for him. For his big moment Col was to be decked out in the official uniform of his Cats which meant, in his words, “real Geelong footy shorts”. For the next few days all he wanted to do was wear the shorts around the house during holidays. He wore a Cats guernsey and the same socks he proudly wears on his prosthesis every day. Well one sock, the other one is still in his drawer and will probably become a part of his next prosthesis. The time came for Col to head down to the team rooms and the rest of the family took their seats to eagerly watch. While we were seated on the opposite end from where Col ran out on to the MCG, we could see him perfectly. For the rest of the game our phones went crazy with people texting to say how they proud they were to see Col run out on to the ground. After completing his mascot duties, Col arrived to sit with us and brushed off our questions about how he felt and what it was like. The game was on so Col said “Sssh, be quiet, I am trying to watch”. It wasn’t until full time that Col started to respond to our many questions. When asked about it Col happily says that, yes, he does get to do these things because he lost his foot, but he is not shy about it and loves to share his story with everyone who will listen. Now that his ultimate AFL experience is over Col is focussing on his swimming and preparing for Nationals after being selected as a multi class swimmer in the School Sports Victoria Swim Team.